Peripheral and accessories maker AVS Gear is now selling its Zippy BT-637 Bluetooth keyboard. 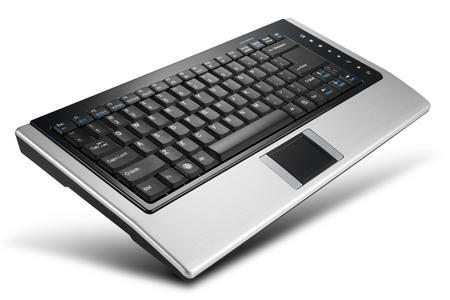 In addition to an integrated trackpad for easy mousing, the BT-637 features fast switching technology that enables users to flip between controlling up to six separate Bluetooth devices, all from the same keyboard. And without the distraction of having to get out of their easy chair. Aimed at home theater enthusiasts and digital entertainment fans, the BT-637 features Bluetooth 2.0, a stylish black design, an integrated trackpad with a two-button mouse and two-finger scrolling support, plus quick-access keys for commonly-used applications. An on-off switch saved battery power when not in use. But the standout-feature is the fast device switching: AVS Gear says “in a matter of seconds” the keyboard can flip between Bluetooth devices, enabling users to switch from a home theater PC to a portable tablet and then to a gaming console or streaming video player without fuss. The Zippy BT-637 is available now from online retailers with a suggested price of $69.99.